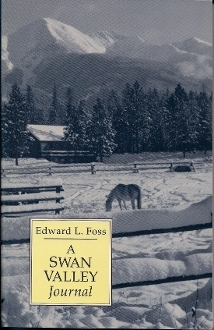 Edward Foss settled down to improve a small ranch in Montana's Swan Valley in the mid 60's. His cabin in is Condon between the Swan and Mission Mountains. His observations of lovely and turbulent events in the valley he calls home are preserved here, in A Swan Valley Journal. This collection of nine essay-chapters illuminates Foss's days at the edge of wilderness, exploring the connections between humans,our animal companions, and the wild creatures whose lives we encroach upon. Stringing journal entries together with philosophy and beautiful prose, Foss touches onthe emotions stirred up by our surroundings and the effects we rough humans have, knowingly and not, on such marvels as deer, elk, hummingbirds, and loons. If anyone may be called a naturalis, Ed oss qualifies He notes that although much can be learned while sitting at a cabin window, more can be discovered from a life afield. Taking a reader across the meadows and high ridges of the Swan country. Foss's thoughtful words defend our shinking wilderness and find a niche for humans in a land that changes with the years and the seasons.